We're joining in with Actually Mummy's Wot so Funee bloghop again this week which is being hosted over at the hilarious Just a Normal Mummy. The Brilliant Chef has been busy cooking for us this week and to see how his fabulous New York Cheesecake turned out you can find out on his blog here. Lots of our homeschool days are fun, but today we made a deliberate attempt to avoid being too 'academic' for want of a better word and do something a bit more creative. Mummy had been on a watercolour painting taster session at the weekend (probably the first bit of time I have had away from all 3 kids for as long as I can remember) and so was inspired to get the paints out and all have a go at being a bit creative. We looked at how you can change the intensity of colour of watercolour paints by adding more water, we saw the difference between painting onto dry paper vs wet on wet painting, and experimented with granulation effects by using both fine salt and rock salt. I'm sure everyone has tried out 'secret writing' using candles or wax crayons, but we also tried oil pastel pictures which we then 'washed' over with watercolours and that worked really well too. They also did do another piece of drawing and story writing but we tried to make the focus on having lots of fun today as they had worked so hard on their workbooks last week. We finished the day by eating D's fabulous new york cheesecake that he had cooked for us yesterday. So look out for the recipe on The Brilliant Chef soon. 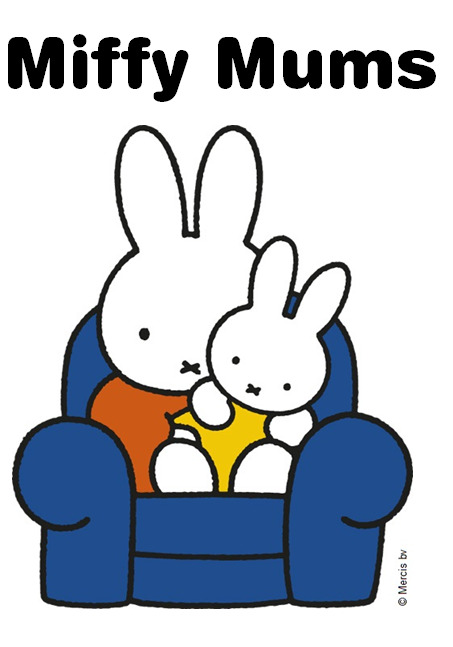 There are two children called Robert and Lucy and three pets. Two of them are dogs called Buster and Rose and a cat called Tiger. There is a war so the children have to go to Devon. Their Dad goes into the war and their mum works on a floating hospital. The pets are left behind. They try to get to Devon to the children. Will they find the children? Will their Dad come back? Read to find out. I liked the book. We actually read this book all together as the age guide on the back suggests age 9+ so I wanted to be sure it was suitable for both J (age 8) and D (age 6). It is set around the time of the second world war so it was helpful to read it together as there were some of the wartime concepts that the boys were not familiar with. We were able to talk about evacuation, rationing, gas masks, air raid shelters and how pets were affected in wartime Britain. It certainly seemed to be a well researched book and I especially loved the part where Tiger gets to meet someone rather important! We noticed today that Trin's 8th tooth has come through. Thankfully she is not mega-troubled by teething at the moment. She has had the odd grumpy day where nothing else was wrong and as it is not like her to be grumpy, we figured out it was probably the teething pain that was bothering her. We had already been sent some lovely teething toys from Nuby previously, and this month, we were sent a Nuby Natural Touch Ice gel CoolBite teether to try out. This teether is made up of two teething keys filled with PurICE gel (which is indended to stay colder for longer). These are securely attached together with a pretty ribbon. Although the ribbon looks tied on, it is actually stitched too so it shouldn't come undone. The pretty pink and purple colour of the 'keys' matches many of Trin's pink and purple clothes. The teether is also available in a blue / green colour combination. The teether is easy for little hands to hold, small enough to take out and about with you and has the advantage of having the cooling effect on those sore teeth and gums over non-gel style teethers. Trin is just getting into the phase of deliberately dropping toys and so the downside was that she happily keeps repeatedly dropping the teether onto the floor (as she seems to be doing with all her toys at the moment!) and enjoys watching the rest of us keep picking things up for her - only to be dropped again. So after a while, I would just have to pop the teether by the sink to be washed again. The packaging does give a useful suggestion to keep a spare teether in the fridge so that you always have one cooling and ready for use, so perhaps we will need to do that. The teether is designed to be suitable for children aged 3 months and over. It is only suitable for cooling in the FRIDGE (not the freezer), so that is important to remember because the term 'purICE' gel and the image on the packaging showing a drawing of ice over the word 'CoolBite' may otherwise cause confusion. Overall this teether has been a useful addition in the battle against teething pain! Disclosure: As Nuby bloggers, Nuby have sent us this product to keep and review. However, all opinions in this review are our own honest opinions. First up: Daniel. Daniel is my brother and he is super annoying. He allways trys to fight me. My mum is crazy about comping. * She is very mad. My dad is a bit crazy but not lots. He has a bit of grey hair. My baby sister is very cute. She poops loads and she first smiled at me. Now into the computer. My monster is called T. Daniel's monster is called N. My mum's monster is called P. My dad's monster is called W. My mum and dad's monster are half dead. *She has some grey hair. Well that's what J thinks of us then! Complete with asterisk about my grey hair - which is virtually non-existent. He is probably referring to the panic I had when I recently found ONE grey hair. Note: ONE SINGLE grey hair not 'some'!!! Oh and before we get reported for neglecting anyone or anything - the monsters he refers to are our online moshi monsters who we used to look after very well before baby Trin came along but I do have to admit that my monster sadly hasn't been fed for over 10 months. Joshua has had a great day and to celebrate here's more of his jokes! I have mentioned before just how well Monday's seem to go for home-schooling, and today was one of those great Mondays. Both boys were really focussed and keen to get their work done and Joshua just blew me away with something he did. I called out for D to bring me some baby wipes from the kitchen and he came back saying he couldn't find them. So as I was about to get up with a mucky T in my arms to make my way to the kitchen, in runs Joshua having overheard and self-initiated getting the wipes for me. How wonderful! I was amazed as he would not normally spontaneously be able to identify or understand a need and then pro-actively respond to it like that. Well done Josh! So to celebrate, I have got the next installment of that huge list that Joshua made last summer of all his favourite jokes. What do you get if you cross a skunk with a pair of rubber boots? How do rodents keep their breath fresh? What's green, ties brilliant knots and loves camping? Why did the golfer have two pairs of shoes? What grace should you say before eating salad? How did you know my joke! How do you know if it's raining? Push your little brother or sister outside and see if they come back wet! Holes tied together with string! That's about all I can type up for today. I think just one more post to get to the end of the really long list Joshua wrote out - Although I have a feeling he will be wanting to share some more of his favourites by then! The reason I am blogging about this is because whenever I try to get organised about planning ahead with meals or trying out a range of dishes rather than sticking to the same boring old repetoire, I usually end up with scraps of paper everywhere (which then disappear) and I never seem to manage to get organised. Well we have had a few relatively successful weeks when it comes to meal planning which I wanted to note down in one place so that I can find it again if I need to. We tried out a veg box last year for a while but whilst I was pregnant I ended up too tired to be cooking from scratch each day and so we stopped. I never got around to properly planning either so although it did mean that I tried out making recipes that we had never made before like spinach canneloni, sunshine squash risotto, and stuffed cabbage leaves, I used to end up having to keep popping to the shops for the extra ingredients that I would need as I hadn't planned ahead. So I ended up spending more time and effort rather than less. This time we have had a couple of weeks with a veg box and then coordinated a few bits of additional shopping to make meals based around the veg. If I am left to plan meals from scratch without having a vegetable ingredient to focus on, then we usually end up having lots of meat based dishes which all end up similar - spag bol, chilli con carne, cottage pie and nothing particularly new or adventurous. Tuesday - Sausages with potato and parsnip mash, with carrots and green beans (not particularly adventurous or amazing but Tuesdays are usually a busy evening with Karate so we need something quick and easy). Wednesday - We made a huge triple batch of lasagne using leeks, celery, and beans in it. We used the minced beef but bulked it up with lots of lentils too. By using old margarine tubs we could freeze up plenty of little portions to defrost another day. Thursday - Leftover lasagne with salad. Friday - I actually ended up making three different dishes today because I wanted to try out different things to do with the leeks. We made a sort of leeky cheese (like cauliflower cheese but with leeks), and also a Leek and Chickpea recipe from Abel and Cole (sizzle and spice spring leek chickpeas which is in their recipe book but I can't seem to find it on their website to link to). The third dish was the big mushrooms stuffed with boursin cheese and breadcrumbs. Saturday - Chicken drumsticks, roast potatoes, carrots, and roast radishes. Yep that does say roast radishes. They taste amazing sliced and roasted in butter and then with plenty of lemon juice squeezed on them. Sunday - Store cupboard ingredients today. Defrosted a couple of chicken breasts I had in the freezer and combined with a tin of coconut milk, thai spice paste and some rice for a thai curry. Monday - I can't remember what we had on the monday but there had been plenty of extra lasagne made to have had that or something simple from the store cupboard like beans on toast or omlette. Ditto Tuesday. The beetroot was used in making D's chocolate birthday cake. Then The next veg box arrived! This time we had parsnips, baby lettuce leaf, courgettes, celery, beetroot, another big red pepper, tomatoes, celeriac, potatoes, Kohlrabi, 2 x squash, and carrots. We added a pack of diced lamb and a pack of minced lamb to the order too this time. Wednesday - Lamb burgers, with lettuce, pepper, celery, and kohlrabi (D loves it raw as a salad ingredient). Thursday - Baked potatoes with cheese / beans and salad. Thursday is another one of our busy days so needed something straightforward and quick to cook. Saturday - used the leftover risotto and stuffed the second squash to have stuffed baked squash. Sunday - Went to a lovely local Nepalese restaurant as a joint birthday / mother's day celebration so didn't need to cook anything myself. Monday - The plan was to use up any leftover veg in a lamb stew with pearl barley (as J loves barley). But the veg that got missed when I asked daddy to pass me all the veg in the fridge was the pepper, courgettes, celeriac, kohlrabi and celery!!! So we still had a great lamb stew but I needed another plan for the rest of the veg. Tuesday - Leftover lamb stew. Bulked up with the barley and split lentils there was even enough to freeze a couple of small portions for Trin for another day. Wednesday - Celeriac and Celery risotto. We didn't get a veg box delivery this week because we had enough bits leftover to keep going with and enough batches of things frozen too to keep us going. Thursday - Leftover risotto. Again there was enough to freeze a couple of small portions for another day. Friday - Citrus cous-cous (using up the courgette, pepper and kohlrabi that had been missed out of the lamb stew) and houmous made with chickpeas I already had and we ate this with crackers, pitta bread and feta cheese. Saturday - Fish portions from the freezer. The birds eye 'bake to perfection' ones are so quick and easy in the microwave with leftover cous-cous. We have still had to pop to the shop for a couple of bread and milk top ups but the majority of the meals have been made using the veg box ingredients as the focus. Amazingly, it has cost us less to do it this way too because a) we have needed less meat, b) fewer trips to the shops mean less impulse buying and c) planning ahead has meant that I had not bought lots of 'just in case' ingredients. The other huge plus point is that it gets us eating veg that we wouldn't normally try. When I buy veg as part of the weekly supermarket shop, I end up sticking to the same old things rather than try anything new. I did manage to get a few piccies of some of the dishes so will try to dig them out and post them up at some point - but more often than not I am all too keen to get stuck into the eating to remember to get the camera out. In aid of Comic Relief. Now you may well be looking at these photos and wondering why on earth I have entitled this blog post "Splish Splash Fun!" when there is no sign of splishing or splashing or any water at all. 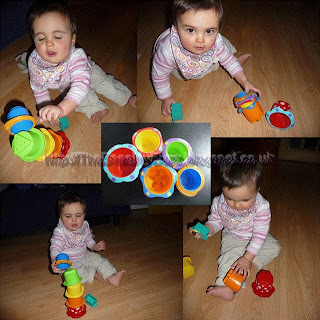 Well this is our review of Nuby's Splish Splash Stacking Cups which are designed for bath time fun. But as you can see they make an equally great toy for having fun even when you are not in the bath! Trinity loved watching the cups being stacked up and then she had great fun knocking them down. We have used them in the bath with Trinity too and she does love to hold them and watch the water run through the little holes in the bottom of each cup, but it always proved too tricky to get photos in the bath whilst juggling baby, the stacking cups and the camera at the same time. There is a set of 5 colourful cups, each a different colour. Each also has a different shape on the base. Each one has a different number of holes for the water to pour out through too - so not only will babies be fascinated by seeing the different 'waterfall' volumes pouring through, but as they get to pre-school age these cups should also prove useful when learning to count, as well as learning colours and shapes in a fun splish splashy way. They would also make a great addition to a water play table and I can imagine that Trinity would enjoy playing with these in the garden in the summer months. The Nuby Splish Splash Stacking Cups are suitable from 9 months. Nuby have some other great fun toys for the bath too and you can see our other bathtime review here. I had spotted a picture of the 'pigs in mud' cake on facebook and decided to have a go. I was pleased with how it turned out considering that baking is not one of my strong points! I made two chocolate sponge cakes (with added beetroot) to get the height needed for the kit-kat barrel. Then made chocolate ganache to stick it all together and stick the kit-kats on. Finally the pigs were made from pink fondant icing. Who would have thought it? Seven years ago we were blessed as Daniel arrived as our second child - a little brother to J. Back then, we could not have guessed that he would become the Brilliant Chef, such a kind-hearted and lovely boy, and a big brother himself to baby T.
Now, on the eve of Daniel's 7th birthday, we are celebrating his little sister's eleventh month and wondering just where the time has flown to! T can now stand (with help), clap, say 'mumumum' and wave. She has also discovered that chocolate cake is never a bad thing, that she has the boys in her family wrapped securely around her little finger, and that she is much loved. There is never a wrong time for chocolate cake! Over the past few months, we have been impressed by Daniel's growing independence, and amazed by his love of food... six years old and choosing prawn curry from the Nepalese restaurant at the weekend! Still loving Moshi Monsters - Daniel Katsuma! I can't wait to see how they grow over the coming year! As we are now into March, I guess you can have the next installment of Joshua's jokes (still a couple more installments in store for you before we get to the end of his really long list!). Because you can't pull their legs. Why did the robber have a bath? To make a clean getaway. I have really been looking forward to writing this blog post. I spotted a really fabulous competition for bloggers over at The Mummy Blogger to write a blog post showing how you would dress your family for Spring with items from The White Company's spring collection. Well I couldn't wait to get started. A nice bit of online window shopping and dreaming about what I would pick - lovely. But life being life has meant that dreaming is all I've been doing because with homeschooling the boys and having a couple of difficult days with Josh, I didn't get the chance to get enough time to myself until now. Trinity is extremely lucky to already have a lovely dress from The White Company which she received as a present when she was born. Our friends had very thoughtfully picked a larger size for her so she has only recently grown into it. We love it because it is lightweight and cotton - perfect for spring in fact. So I know that The White Company's clothes are of really high quality, so let's see how I do on picking out some great styles for my family. 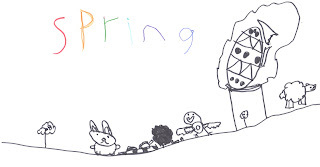 Particularly as Spring is my favourite season! The days are getting longer, and brighter, and a bit warmer. The bulbs are poking their heads out above the ground. Nature starts to wake up from it's Winter sleep and Spring gives me a sense of hope. 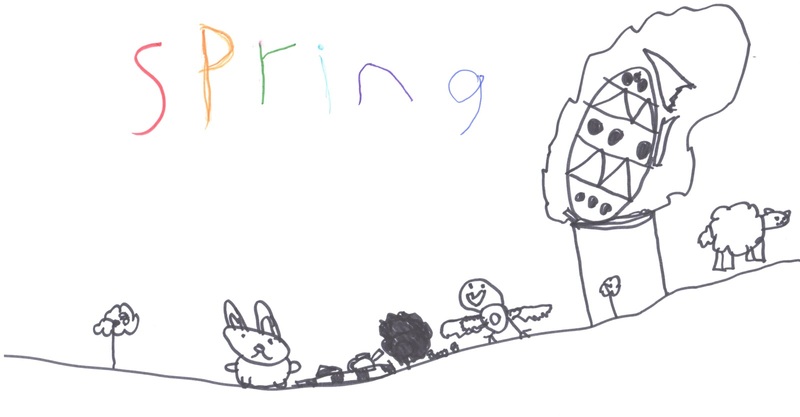 Now if you ask Josh what he loves about Spring, you would hear 'Easter, chocolate eggs, bunnies and lambs'. Daniel would also agree it is his favourite time of year with his birthday on its way next week. Now normally, I would rush over to The White Company's website and start to choose my favourite items but I decided to stop and think first about what would make a good spring wardrobe. Spring clean your wardrobe before you go shopping. Is there anything that really doesn't suit you? Any clothes that have got so old or worn out and are beyond repair? Sort through the children's clothes and pass on or give to charity anything they have grown out of. Key items of clothing. Although I would LOVE to treat myself to an entire new Spring wardrobe each year, reality dictates that it would be impossible. So I try to pick out a key piece of clothing that would make me feel good and that would mix and match well with other items. Clothing that can be dressed up or dressed down. Think about whether your new items could take you from daytime to evening with a pair of heels and some nice pieces of jewellery. Layering. With warmer Spring days, it is handy to have clothes that can be layered up by adding a cardigan or a scarf for example. Or layered down, eg a top that looks great with either trousers or shorts. Comfort. This is crucial for kids (especially for mine with his ASD sensitivities!). If it isn't comfy, I'm going to have a battle forcing the kids to wear it. 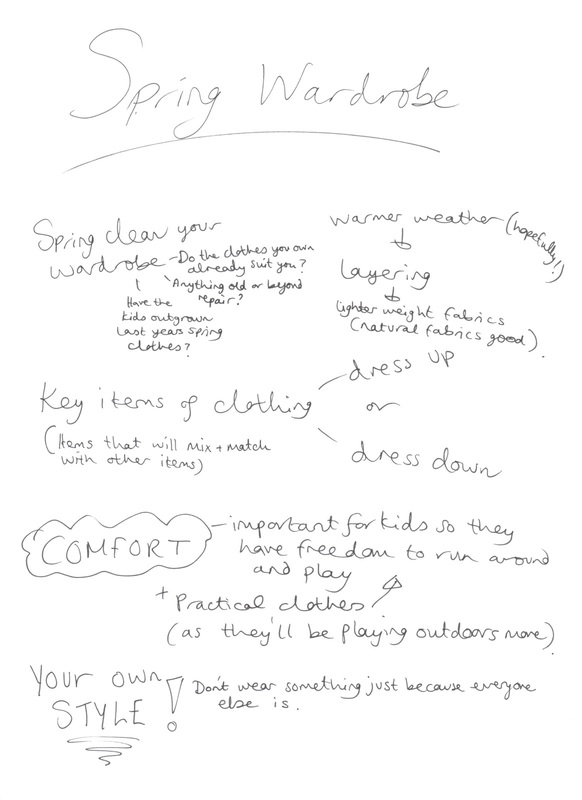 If clothing is comfy and practical, then it is going to be great for playing outdoors more in Springtime. Be prepared to go against the crowd. If something doesn't suit you, or makes you feel uncomfortable wearing it, then don't. Just because everyone else is, it doesn't mean you have to. (This won't be a problem at The White Company because there are some great styles to choose from, that you are sure to find something you'll love anyway!). Now for the REALLY fun part. 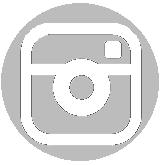 I looked through The White Company's fantastic range of clothing for me, the kids and daddy and pinned the items that caught my eye onto my pinterest board. Next, I took another look through and arranged the items I love the most for each family member onto these collage-style boards to really give me a feel for what would work well. On each board, I have marked what I consider to be the 'key piece' with a heart symbol as I tried to build up the overall look based on a key piece for each family member. The key piece I have chosen for Trinity is the gorgeous grey Floral Dress﻿. It comes as a dress and knickers set (to cover up nappies that can look so unsightly). If we have cooler Spring days, then I would just switch the knickers for a pair of these pink or grey tights. They come in a pack with both a pink pair and a grey pair for £10 and either colour would coordinate with the dress really well. Still thinking of cooler days, I have also chosen this Petal Pink Pintuck Cardigan which would keep Trinity nice and cosy. And whilst I am hoping that it will be warm enough and sunny enough for her to learn to take her first steps in bare feet on the grass, I would be prepared in case the weather wasn't so kind to us and get her these Grey Baby Pixie Booties to protect her tiny feet and toes and keep her warm. The final item I have chosen is in case of a really hot spring like we witnessed a couple of years ago. This 100% cotton Seersucker Stripe Shortie outfit would keep Trin cool. The blue stipes would also complement the boys 'contingency for really warm weather' outfits as you will see. I have deliberately chosen to do a combined board for Joshua (aged 8) and Daniel (age 6, very nearly 7 as he would excitedly tell you!). The reason being that the boys have been very fortunate to have received lots of lovely clothes handed-down from friends over the years, which they then pass one to the other as Josh outgrows them and so they rarely get treated to anything new. So when they do get brand new items of clothing, both me and they like the idea of getting clothes that match or really coordinate well with each other. Hence the key item on their board for them both is the Chino Shorts (in Navy of course as the white ones would not stay white for very long at all knowing what my boys are like!!!). Then for the top for Joshua, I would chose the Balloon Motif Sweater. The reason why I have chosen this one for Josh, is firstly it actually looks quite warm and cosy and Josh seems to really feel the cold more than most. Secondly, he loves hot air balloons. So much so that I remember him drawing pictures of Santa in a hot air balloon one Christmas and he kept it up for months afterwards until we had to explain that Santa needed a rest from having to trek over from the North Pole each night to keep collecting the drawings. For Daniel, I would chose the lighter weight Cotton Linen Sweater. In direct contrast to Josh, Daniel actually seems to feel hot most of the time and so the Cotton and Linen mix makes this lightweight sweater the perfect choice for him. Teamed up with a pair of Superga Plimsolls (again in Navy not white in an attempt for them to stay looking cleaner for longer! ), both boys would look and feel great for Spring. I have added one final touch for the boys as a contingency for really warm weather. These Striped Vests would help them layer up warm for cooler days underneath their sweaters and on really really warm days, the boys would happily strip down to these vests because with these fab stripes, they look really great. We would have to get the Striped Jersey Boxer Shorts to match because for some reason my boys love to receive underwear! I am guessing it is because they don't often get brand new items of clothing, that pants seem to be the one item they do get from new, so they get rather excited. Both the vests and the boxer shorts come in a pack of 2 - so that's perfect for us. Josh would get the dark blue stripes and Dan would get the lighter blue stripes as that would suit them best. Decisions, decisions. Mummy found it the hardest to pick out the perfect spring outfit because there are just so many lovely clothes to chose from. I would have loved to pick this Short sleeve knitted tunic in charcoal grey as my key piece but I had to take into consideration how much the style would suit me (or not in this case as I am still carrying some post-pregnancy baby weight). So far better for me would be this stunning Cotton Broderie Notch Neck Tunic dress. I think the style would cover my lumps and bumps well and I know the notch neck style would suit me as I used to have a favourite top with a notch neck. I would chose it in white (although it is also available in Navy). I really feel I have found the 'key item' of all key items with this dress because it would work as a dress for warm days (and those days that I am brave enough to get my legs out to get some sun), and it would also layer up as a warmer outfit combined with trousers. I reckon it would look great with any of the trousers and jeans in The White Company's range but I have chosen the Navy Slim Capri Pants combined with the Superga plimsolls in white as my day look. For a special occassion or to 'dress up' the outfit, these Washed Linen Trousers in white would look stunning combined with a pair of gorgeous sandals or heels. For really warm days (in case of that heatwave we are dreaming of), I would be prepared with the Bow front swimsuit with blue stripes (linking in with the colour scheme of Josh, Dan and Trinity's warm weather outfits). And for cooler days, this stylish pink scarf would help keep the chill away. Now, I want to say last but not least, it's Daddy, but actually Daddy does get the simplest outfit of all. Simple but stylish. Daddy works so hard all week in stuffy suits that he deserves some comfy clothes to lounge around in at the weekend. I know he'll like it and it looks super comfy so I might even be caught wearing it on a jim-jam duvet kind of day. The Men's Henley T-shirt is relaxed enough to team up with these pyjama trousers at home, and yet sophisticated enough to wear it out and about with a pair of jeans. One of the things I really like is that so many items of clothing from The White Company can be mixed and matched as they coordinate well together. I think we would also look great as a family because the whole look seems to coordinate well throughout each family members board. There is a big selection of natural fabrics which will help as the warmer weather comes and natural fabrics like cotton are kinder on my childrens skin. Another big plus point is that the collection seems to ooze an effortless style and sophistication that I would definitely normally struggle to acheive. Yet with a few key pieces working so well together, I would feel confident that I had 'got it right' rather than risking a big fashion faux pas by buying different items from different stores. This is my entry into The Mummy Blogger's fabulous "Dress your family with The White Company Competition". If you are a blogger, and fancy joining in (I promise it is great fun!!! ), then do pop over to The Mummy Blogger and find out more. Even if you don't fancy joining in with this one, then there are lots of lovely competitions, reviews and more over at The Mummy Blogger. This is not a sponsored post and we haven't been asked to write this, but it is just a genuine sharing of a product we have been impressed with. I recently won a voucher to spend at Tiny Me and we decided to get a personalised door sticker for Trinity's room as the boys both have their names on their doors but Trin didn't. The stickers arrive printed onto a sheet in separate parts so the great thing is that with this design we could put the stickers up in any way we wished. We ended up using the 'spare' bits on mum and dads door! To start with I was so nervous about getting air bubbles trapped in or putting the stickers on wonky, but I really needn't have worried because these stickers are fully removable and repositionable. Thank you Tiny Me for helping to brighten up Trinity's bedroom door! but you work longer than 9 to 5. Something you've brought to life. Somewhere to escape to and hide. Someone in whom you confide. In which we can take pride. Sharing laughs and sometimes having a cry.